Sure, sometimes you want to lovingly chop every chili and adoringly crush every peppercorn yourself. But more often – or, like many of our devotees, always – you’d rather grab a seasoning rub and go. 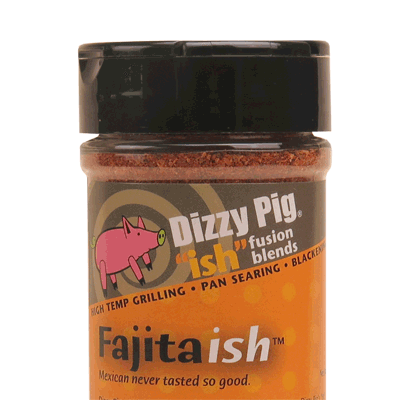 Well, we’ve got exactly what you’re looking for with our Fajita-ish blend. A cunning combination of chilies, cumin and Mexican oregano, this rub enhances any protein or vegetable and stands in for taco seasoning any night of the week. If you love those Tex-Mex flavors, you can’t go wrong with this option. It’s ideal for fajitas, fish tacos, burritos and chili, beans or simply a salad. That’s not to say, however, that you can’t grill up some killer barbecue with the same blend, because you can. No matter what you choose to concoct with this blend, you’ll get a fine flavor worthy of any Mexican hat dance. And Fajita-ish™ contains NO sugar!